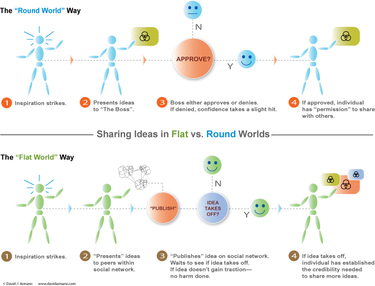 Sharing ideas in flat vs. round worlds Download flat_copy.pdf is more or less the story behind Logic+Emotion. At one point in my career, I submitted an outline for a whitepaper expressing many of the ideas you will find on this blog. You can guess where that idea ended up in the round world—nowhere (except maybe the round trash receptacle). But we are living in a FLAT world. And this translates to doing things like sharing ideas with a network of peers to validate and refine ideation. The “boss” in some ways has been removed. Logic+Emotion launched in February of 2006 with virtually no exposure. It simply was not on anyone’s radar. L+E is currently ranked at #21 in the Top Advertising blogs and is poised to enter the Top 25 Marketing blogs as well. This can only happen in a FLAT WORLD. If you want to hear more about the L+E story, go here.